Pressure Relief Valve used because; 1. To Maintain desired pressure levels in the circuit. 2. To set maximum pressure in hydraulic system. 3. Protect the pump and other system components from overloading. 4. It acts as a relief and safety device ExplanationSimple pressure relief valve is also a Direct operated pressure relief valve. It consists of Poppet, spring, pressure setting knob and valve body. 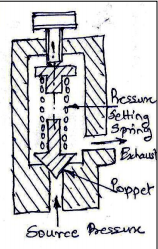 It is normally closed valve connected between pressure line and the oil reservoir when inlet oil pressure is less than the spring force; it means that it is insufficient to overcome the spring force, the valve remains closed. The pressure of oil is safe for the system. When the oil pressure is greater than spring force, it pushes the poppet against the spring force and unseated the poppet. Now the valve opens and oil flow from inlet port to the reservoir. The valve will remain open until the excessive pressure is diverted to the tank. Cracking pressure: the pressure at which the valve first opens is called the cracking pressure. It is essential for every hydraulic system to provide pressure relief valve as a safeguard against the pressure.